Hello Linux Geeksters. As you may know, VLC is one of the most popular media players, available for Linux, Windows, Mac OS X and mobile platforms. On Linux and Windows, the Srpos plugin makes VLC automatically save the playback position, so that the users can easily resume the movie from where they had left it. The latest version available is VLC Srpos Plugin 0.3, which has been released a few days ago. In this article I will show you how to install VLC Srpos Plugin 0.3 on Ubuntu 14.04 Trusty Tahr, Ubuntu 14.10 Utopic Unicorn, Linux Mint 17 Qiana, Pinguy OS 14.04, LXLE 14.04, Elementary OS 0.3 Freya, Peppermint Five, Linux Lite 2.0 and other Ubuntu 14.04 derivative systems. 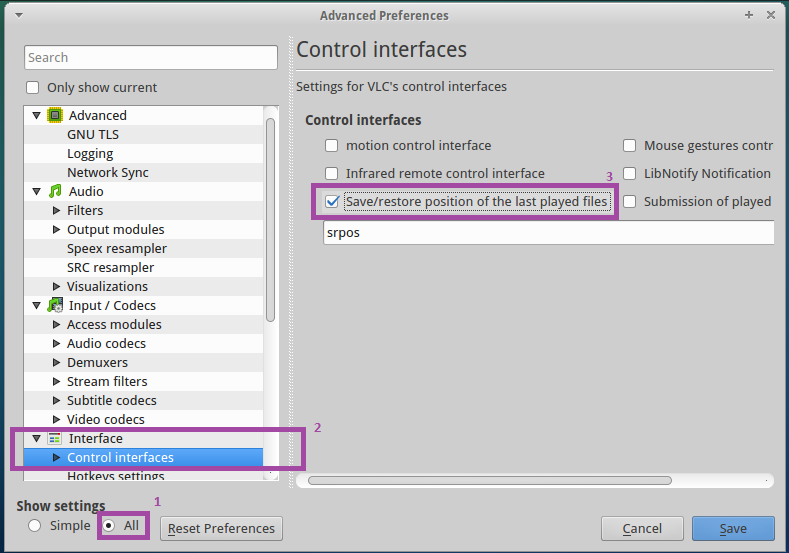 To enable the Srpos plugin, start VLC and go to Tools > Preferences, thick “all” in the bottom left corner under “Show settings”, find “Interface” in the list in the left, click “Control interfaces” and thick “Save/restore position of last player files”. Like i did in the below screenshot.